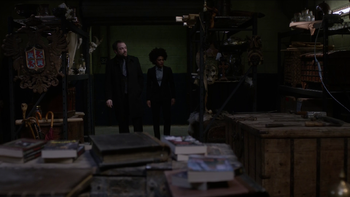 Crowley's Lock-up is a personal storage locker where Crowley keeps his various keepsakes, mementos and powerful objects he doesn't wish anyone to know about. Copies of the Supernatural books. Childhood portrait of Fergus Roderick MacLeod. After being set free from Lucifer's imprisonment by Simmons, Crowley leads the demon to retrieve the "ace" up his sleeve. 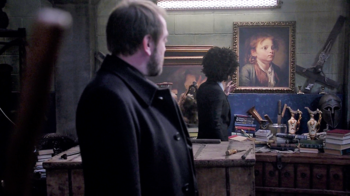 Upon arriving, Crowley tells Simmons that this lock-up is for "keepsakes, mementos, things I’d prefer the rabble not to get their grubby hands on." 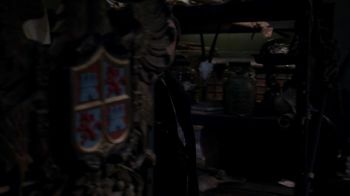 As Simmons investigates the storage unit, Crowley begins shifting through some of his things when he finds an old box which contained the Rod of Aaron. However, Lucifer soon strolls into the unit, revealing that Crowley's escape was all a part of his plan to find out if Crowley was keeping anything from Lucifer. As he pushes Crowley out of the way, Lucifer moves the box and then opens it to find it empty. He closes the lid, and turns to look at Crowley, who is now holding the Rod of Aaron in his hand. As he absorbs the power, Crowley releases the energy towards Lucifer, who is saved when Simmons jumped in its path. Crowley remembers the "the good old days." This page was last edited on 22 December 2018, at 01:30.